Sidney Rauchberger has published an article on the challenges of Unreal Tournament’s Blitz level design. 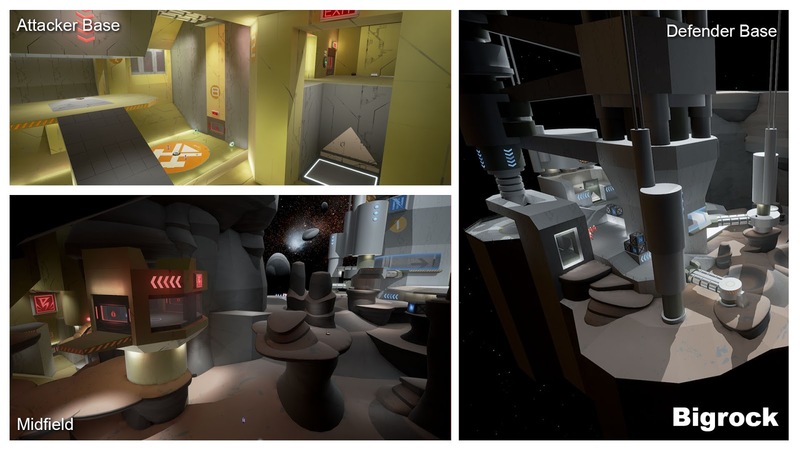 The report is full of useful tips and tricks on building balanced and fun multiplayer maps. Today we are taking a look at the origins, current state, and future of Blitz level design. This blog post is intended for anyone that has a general interest in our approach and thought process when designing levels, as well as community level designers that are interested in helping contribute to and shape the Blitz experience with their own creations. Our goal is for Blitz to become the primary 5v5 game mode for Unreal Tournament. We want to retain some of the core ideas of what make Arena Shooters fun, while at the same time modernizing aspects of the game that may be stuck in “legacy land” for no particularly strong reason. Our first testing grounds for Blitz were a few of our old asymmetrical CTF shells. 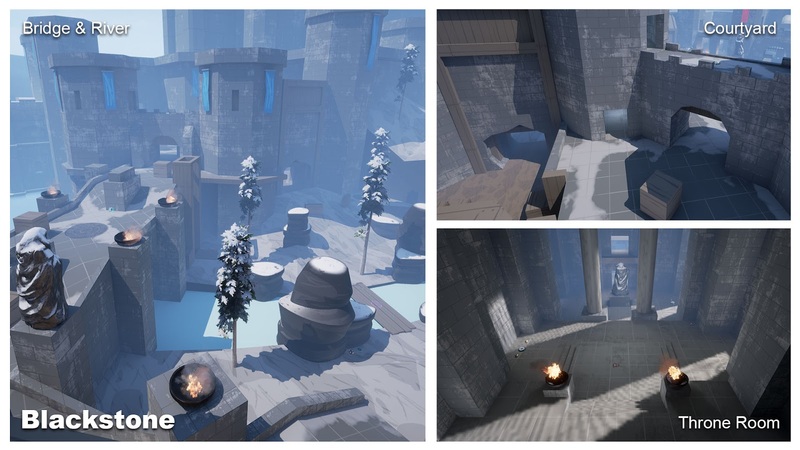 We knew that asymmetry was going to play a huge part in the gameplay and feel of Blitz, so those types of maps were a logical place to start to get something up and running quickly. So what are the origins of Blitz level design, and what did we learn from them? CTF-Bigrock ended up being the shell we iterated on the most because a lot of its inherent design lent itself well to Blitz as a starting point. Blackstone was the first shell that was purpose built for Blitz, and incorporated a lot of the lessons learned from testing Bigrock. We learned a ton more with this one and came up with a lot of core components and mechanics of the game mode thanks to this map. It is currently on hold but we may return to this and give a few areas a once over now that we know more. It took from the open concept of Bigrocks midfield and expanded and improved upon it by adding a second lane (“Bridge”) next to “River” that allowed for different approaches and forced defenders to chose where to pay attention. One of the core concepts born out of this map is the proximity and traversal between the options players get at the first choke point. In “Courtyard” defenders are able to rotate their numbers to anticipate shifts in attackers movements without being too far removed from each side. We eventually made a conscious choice to only rely on jump pads for critical path gameplay to allow teams to move together. Lift jumps are still a valuable option but should be looked at as supplemental. The attacker lead up into the first combat bowl was too long, repeated spawning (even with rally) often felt tedious (and a bit mazey). Choke points were very even in size, and especially deeper into the map were too easily controlled from one position. The defender base had a high entrance that allowed for very volatile trick-jump-insta-cap scenarios that were not easily anticipated and observable, making for frustrating “what just happened” moments. 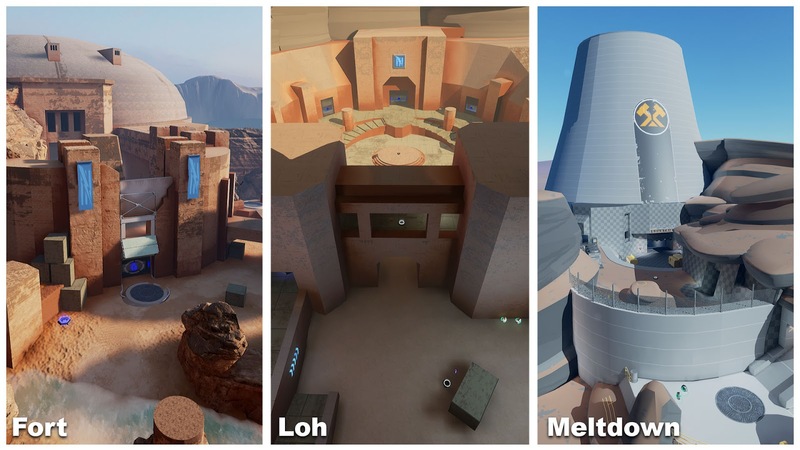 The first 3 maps we are moving forward with are Fort, Loh, and Meltdown. We feel these maps best represent the components we distilled down to be crucial to the Blitz experience. One key element to keep in mind is that we are putting a lot of focus on making sure these first few maps are easily digested as an entry to Blitz and don’t try to get into the way of the game mode. We aren’t aiming to be flashy with complexity, but instead are trying our best to distill the experience down to its simplest parts to let the game mode shine. The following is a simple structural breakdown of the main components of our maps that so far have been successful. They are a good example of sharing all the same basic elements while at the same time trading length for complexity. Staging area and safe space for the defenders. Provides the ability to heal and stock up on ammo. Only defending team can shoot through exit barriers. Exits need to establish good flow into defender base and provide options to combat potential spawn griefers. Minimum of 2 exits (or 1 exit in the case of split rooms). I.e. one-way windows, 45 degree slants following the exit, etc. Opportunity to thematically stage the level, affords freedom to do some set dressing since there is no combat happening. Can be short thresholds or small spaces. They are relatively tight, contrast in spacing with the bowls they are connected to and function as funnels for attackers. Chokes have to be easily understood and identified via their physical structure. A natural boundary/defensive line that is easily understood by both attackers and defenders. The first of these is where defenders are comfortably able to get to within the door unlock time. Holding and pushing past these thresholds should feel like a big power shift between attackers and defenders. Utilized to build or maintain momentum, fake out defenders, quickly rotate between lanes, and gather the attackers together to push. Placed near (before and/or after) choke points. They need to be oriented in the direction you want rallying players to face as they teleport in. They are ideally situated on the outer edge of the map, adjacent to the major flow direction. In most cases, rally points should be in a space that is open enough to be contestable while still offering a moderate amount of cover and/or evasive space. Rally Points must have a strong landmark nearby (ideally integrated) that can be utilized for call outs. Bigger and more open, arena-like spaces. Affords largest surface area for gameplay variance and experimentation. The carrier is challenged to traverse these with the help of his or her team and *has* to be easily visible to defenders while on the move when someone is paying attention. Making these too porous and maze-like means a carrier can easily sneak through without ever being seen, which is bad. At the same time, we have to make sure that there is enough cover to dart between while still allowing sight lines through easily understandable corridors that are long enough for players to utilize effectively. Multiple lanes that interconnect with each other and with choke points in ways that add advantages and disadvantages to taking each path. Pickups (weapons/armor/powerups) act as sub-objectives for players. It is generally advisable to not go too wide with these spaces to ensure the overall combat front is maintained and we don’t introduce a secondary perpendicular front. Staging area and safe space for the attackers. Provides the ability to heal and stock up on ammo. Only attacking team can shoot through exit barriers. Provides access to a Redeemer (spawns after 3 star time has elapsed). Exits need to establish good flow into connected combat bowl and provide options to combat potential spawn griefers. Minimum of 2 exits (or 1 exit in the case of split rooms). The basic level flow is intentionally simple and straightforward. While we consider the overall structural breakdown to be established already, there is room for variance and some added complexity inside of the individual elements for future, more advanced designs. This can theoretically be expanded to other actors via interface, but it is recommended that this element is utilized sparingly. Those patterns have so far proven most successful for us (5 man shock is insane on defense the same way 5 man rocket is on offense). It takes some restraint to create a successful Blitz map. It is very easy to get too elaborate with paths and designs, or jump to the conclusion that “more objectives=more choice=more fun”. 45 degrees is generally the better choice. Blackstone, Heist, and Highroad are our other shells that are currently on hold and may be revisited later. They don’t hit the same quality bar yet but may still be useful for investigation of what works and what doesn’t and/or serve as inspiration for improvements in your own designs. The entirety of the creation of Blitz throughout its various iterations has been a huge team effort. Every discipline on our internal team as well as the community have had an influence and helped in solving particular problems in unique ways across all fields. The team is currently hard at work turning our first Blitz shells into finished levels and is continuing to refine the overall experience. At some point soon we will be taking a look at what to tackle next with regards to future Blitz levels and we’ll likely be looking at ways to reconfigure the formula without straying from the overall structure. We’ll also be exploring ideas that can afford to offer some more advanced and intricate geometry without creating an experience that is opaque and unfriendly to people that are just starting to get their feet wet. This is where the community can have a huge impact on further shaping Blitz by refining and pushing on existing standards as well as exploring ideas that might otherwise be seen as fringe but could turn out to be amazing. The article was originally published on the official blog.